ArgentiainThe Los Angeles County Metropolitan Transportation Authority has selected an STV and WSP USA joint venture to play an integral part in its Zero Emissions Bus (ZEB) Program that will transition the agency's entire bus fleet from compressed natural gas to zero emission technology by 2030. "Metro's Zero Emissions Bus Program will be a game-changer for the bus industry and the ZEBGO Partners team is honoured to be selected for such a critical role," said Paul Kaufmann, STV's senior engineering and operations manager. "We anticipate this initiative will set the standard for the bus industry's zero emissions bus energy storage, charging, propulsion and facility integration technologies." 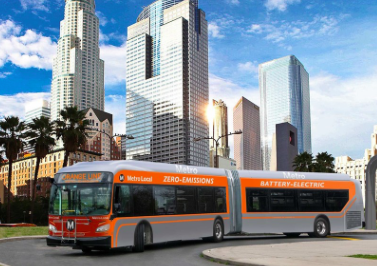 "Our goal is to have a 100% zero emission Metro bus fleet by 2030," said LA County Supervisor and Metro Board Chair Sheila Kuehl. "This partnership provides us with the expertise and know-how we need to achieve that goal." Metro currently operates one of the busiest bus systems in the United States, with nearly 800,000 passenger boardings a day. With more than 165 bus routes making nearly 14,000 stops amid some of the heaviest traffic congestion in the nation, Metro's board of directors approved its transition to zero emission buses in the summer of 2017. Upon the completion of this initiative, Metro will be the largest transit agency in the United States committing to operate a fleet consisting entirely of zero emissions buses. ZEBGO will conduct a comprehensive industry outreach program to identify the latest cost-effective technologies and initiate concepts for the fleet and facility transition. Additionally, the joint venture will evaluate existing infrastructure for integration needs, bus route and schedule analysis, provide life cycle analysis for all emerging relevant technologies, and investigate potential funding opportunities to support the plan. Argentina's authroities announced a similar plan for Buenos Aires last year.